I like to butter my rings before lining with dough. It will slide down the ring more easily and won’t ever ever stick to it once baked. These days I always roll my dough in betwen two sheets of feuille guitare, a thin acetate. 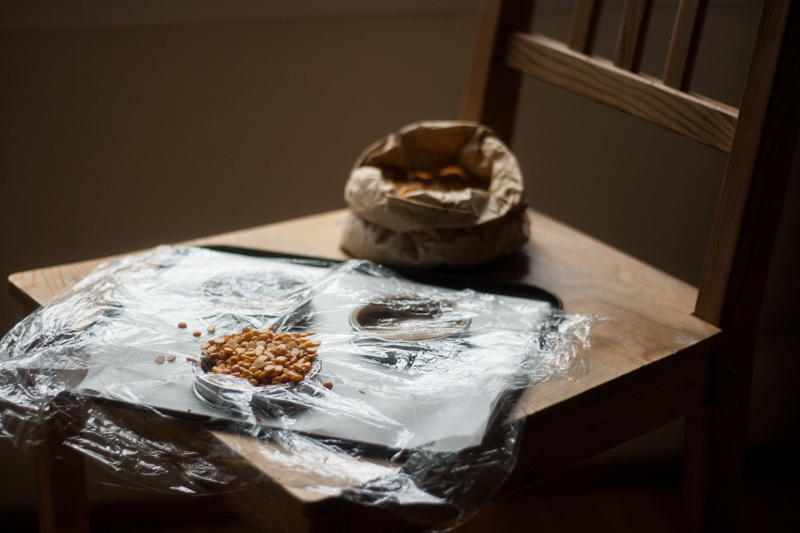 If you can get your hands on it, it’s much better than baking paper, as the dough won’t crease. If I’m using pâte sucrée or as I show you here my favourite biscuit dough (any kind of soft dough that patches well, really; I can’t think of any aside from pâte brisée or feuilletée), I like to cut strips to the height I want my tart to be and a disk for the bottom. This is way easier to handle and creates a flawless tart case with perfect corners. To calculate how long the strips that goes around the ring should be, it’s very simple. And then, for the bottom-disk: just cut it one cm smaller than your ring. To line the ring, simply place the strip of dough on the inside, sealing with your fingers where the two ends meet. And then place the disk of dough in the centre, pushing it slightly so that it reaches the sides. Run your finger to smooth out and seal. I usually go for clingfilm whenever I’m blind-baking a large tart (bigger than 10cm-wide), as it’s the most convenient. 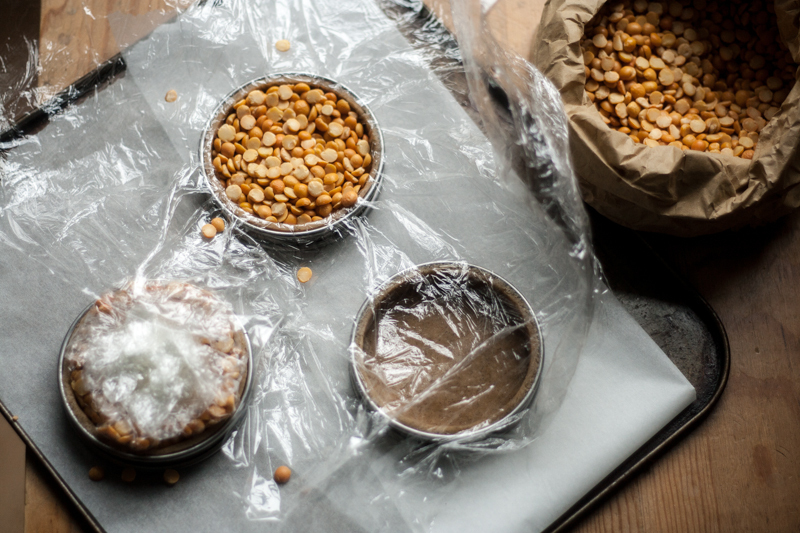 Simply layer two large pieces of clingfilm, smoothing out with a tea towel, then place over your unbaked tart case and add rice or pulses up to the rim. 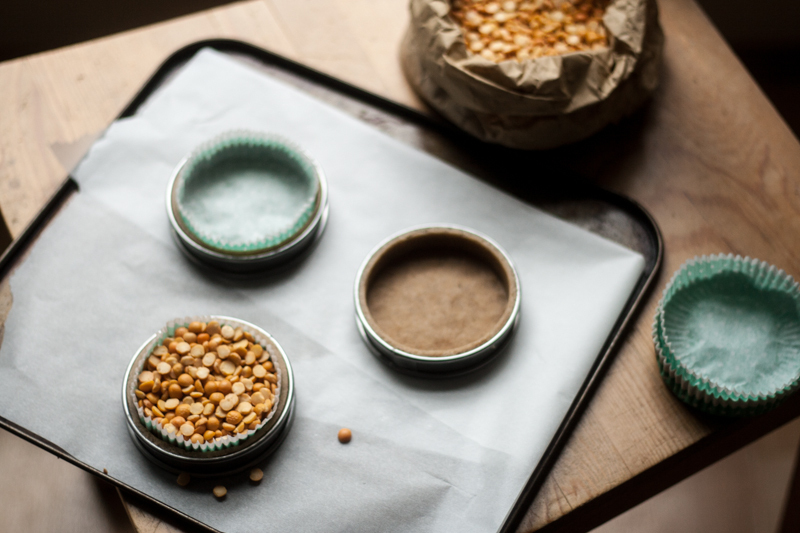 Press with your hands to compress your baking weights, making sure they go well into the corners of your tart. Loosely close your clingfilm. If you wrap it too tight, the clingfilm as it shrinks a little with the heat, won’t be in contact with the sides of your tart anymore. This is my go-to method, one that I learnt at Pierre Hermé, back in 2007. Using your fingers you “break” cupcake paper so that they are the size of your ring. Fill with rice or pulses. And you’re pretty much set. It’s incredibly easy, reusable for almost-ever and the fastest. 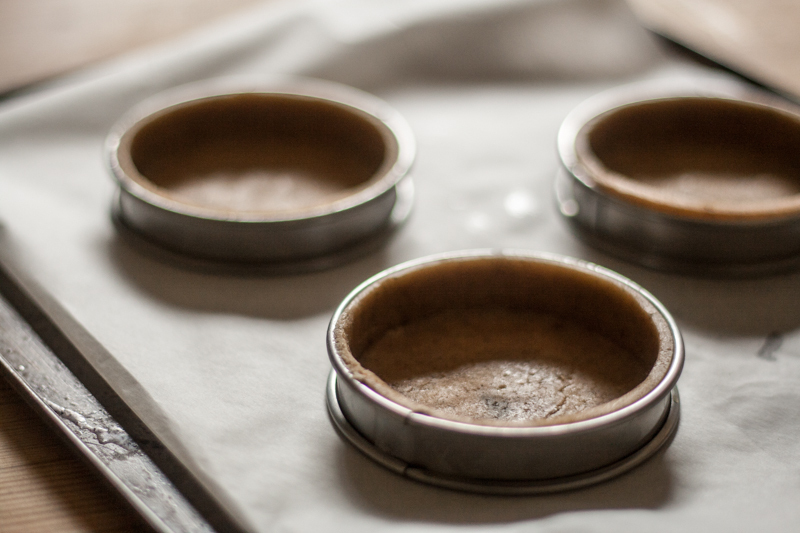 This method has only one downside: it will leave imprints on the baked tart case. At the restaurant I always go for 155°C, but at home, in my not so amazing oven, I’ve found that 165°C works perfectly. Of course it also depends on the kind of dough you’re using. The best is to experiment, until you’re happy with the results. As a general rule though, 150-160°C for fan-assisted ovens, and 165-170°C for traditional ovens. This is my absolute favourite trick to make tart cases neater than neat. Simply trim any bits of dough that might have popped out a little out from the rings, either at the base or the top with a peeler. Do this when your tart case is completely cold. And ever so gently. No thank you. They’re too big: don’t get in the corners. 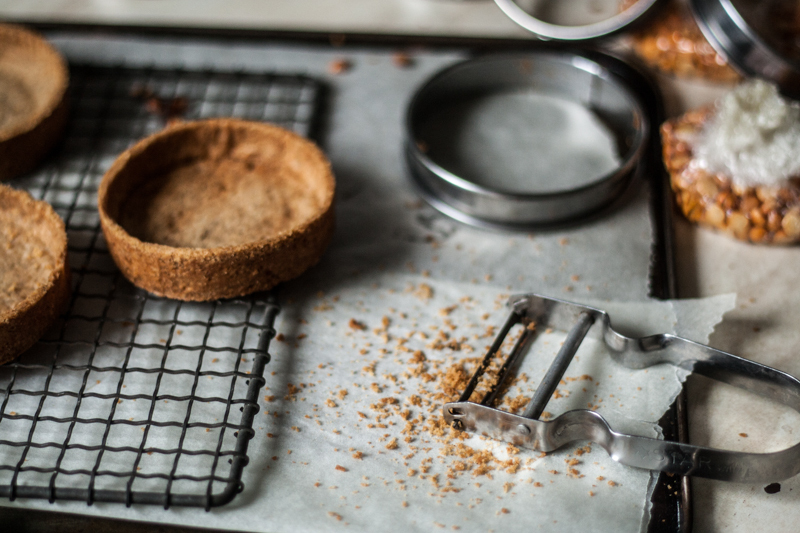 Too heavy: break the delicate structure of your dough, leave imprints. Too expensive. So many useful tips. Thank you Fanny, I can’t wait to try them with the tart I’m planning on baking this weekend. Really useful guide to blind baking! 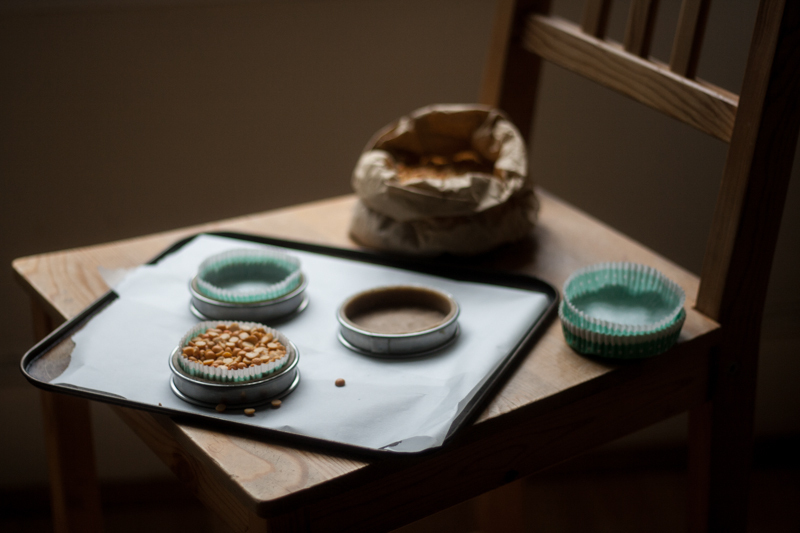 How do you stop your pastry from slipping down the sides of your tin? Thank you for this post! 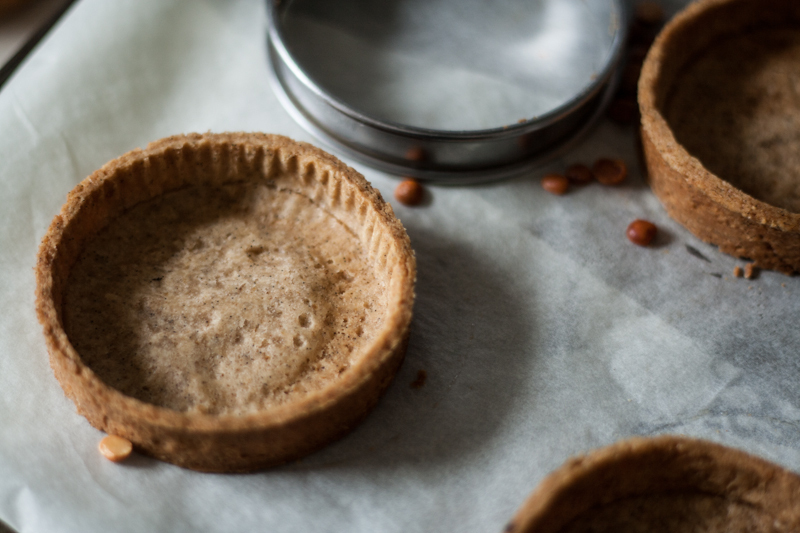 I have always struggled with blind baking small tarts. I love the idea of the cupcake liner! I also got your book for Christmas. Can’t wait to start trying some recipes! I love your trick to “peel” a tart! One question though: Where do you get these tart rings (in Austria or Germany)? It’s even hard to find them online… I’d be grateful for any recommendations, thanks! I love the trick about peeling the tart, never think about it, but I always need it!!! I like the imprints of the paper liners (and, anyway, anyone is going to notice when you fill the tart), and is a really fast and easy way, I promise I will also try!!!!! Ah lala ! Content de t’avoir retrouvée ! Ça faisait longtemps ! Comment ça va ? are you not worried about food safety and what is released by the cling-flim when you’re baking it at 150c ?